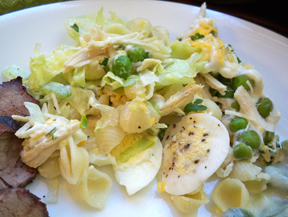 This salad is a perfect after Easter recipe since it uses leftover hard-cooked eggs and ham you might have. 1. Place salad greens in bottom of large serving bowl. Layer tomatoes, 1 cup of cheese, peas, eggs, ham and onion over greens. 2. Mix mayonnaise, sour cream, dill weed and ground mustard in medium bowl until well blended. Spread evenly over salad. Cover. 3. Refrigerate at least 1 hour or overnight until ready to serve. Sprinkle with remaining 1 cup cheese just before serving. 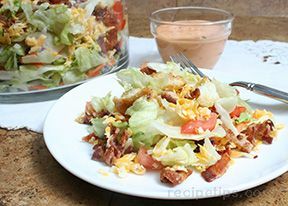 Make It Your Way: Use any variety of your favorite ingredients such as cooked chicken or turkey, canned tuna, olives, canned beans, cooked potatoes, cooked green beans, sliced mushrooms, corn or crumbled bacon in this salad. Supreme Layered Salad: Prepare as directed. 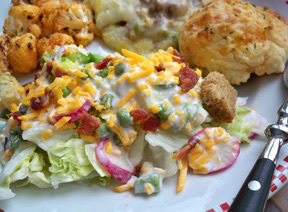 Use 1 1/2 teaspoons McCormickÂ® Salad Supreme Seasoning in place of the dill weed and ground mustard.